The Bible teaches that Abraham was justified (declared righteous in God's eyes) not by his diligence in keeping God's laws (which none of us can fully keep) but rather by his faith. And it was not just generic faith that made Abraham righteous. Rather, as Paul says here in Romans 4, Abraham was declared righteous by God because of his faith in God's promise. In other words, God made a promise to Abraham, and Abraham trusted God enough to bet EVERYTHING on what God told him. But what is the promise? And more importantly, WHO would bring it to fruition? For answers to these questions, listen on . . .
As for the journey around Indonesia, what a ride!!! I had amazing visits with dear friends and made many new friends as well--including meeting with a group of village elders and a surprise visit with the governor of a major province. All along the way, there were stunning opportunities to interact with beautiful people. My Muslim hosts loved me lavishly at every turn, and I count it a great privilege to call them my dear friends and my partners in the cause of peace. Here's a short clip that should give you just a taste of my work and experiences along the way. PS: Would you consider a donation to sustain and grow our work? December is when we do most of our fundraising for the year, and we would be grateful if you would partner with us via a donation. For details regarding how to give online or with a check, CLICK HERE. For all of you who already give so generously, we have nothing but gratitude in our hearts for you. Thank you! On Saturday, July 23, Apex Mosque (Apex, NC) graciously hosted Mark and Nancy Siljander and built an event around them. 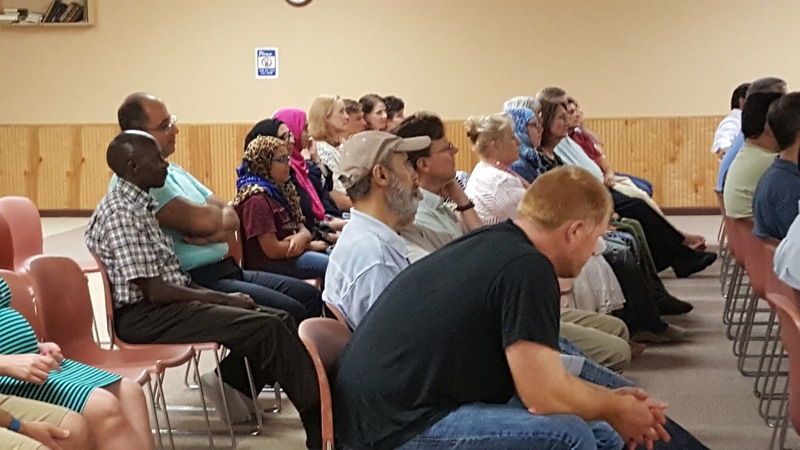 Although my friends at the mosque expressed disappointment that there were not more Muslims present, I thought a nice crowd (maybe 80?) of Muslims and Christians turned out to here Mark's message. 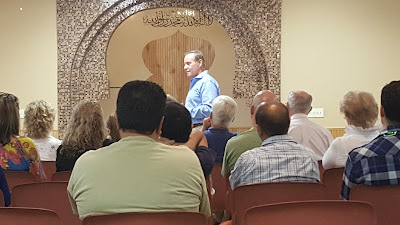 Mark spoke for about 90 minutes formally, and then after the Muslims' evening prayer (Maghrib) he answered questions informally for another 75 minutes (until 10pm). Unfortunately, there is no recording of Mark's talk at the mosque. The good news, however, is that Mark and Nancy delivered the sermon at our church (Fellowship of Christ) the following morning, and we did manage to capture that message. Mark covers most of the sermon, but Nancy comes in quite powerfully for the last seven or so minutes. I believe you'll be significantly challenged and encouraged by their story, which includes a stint as a US Congressman, traveling the world to share peacemaking ways of Jesus in the most troubled of locales, and a year as an inmate in a maximum-security US federal prison (in which Mark brought Jesus' love and peace to violent gangs). At our church, the response to the Siljanders' message was overwhelmingly positive. For example, one older man came to me in tears after the service and said that he was being set free by Mark and Nancy's words. A younger man confided that God used their message to convict him of a harsh attitude toward those with whom he has differences, and he already had a list of people he would approach to seek forgiveness. Very good stuff! Carrie and I have love and gratitude in our hearts for each of you! And thanks to all of you who prayed for this event at the mosque. 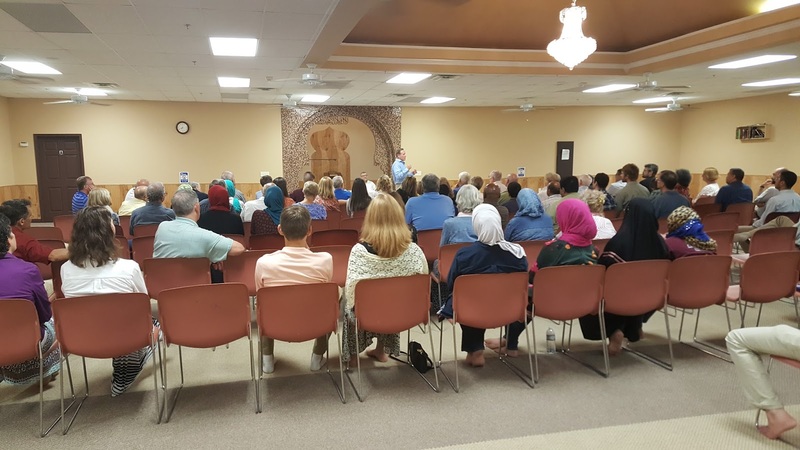 It was a success, and we ask you to join us in praying that this gathering will lead directly to more and deeper friendships between Muslims and Christians. PS: Here are a few images from the Apex Mosque gathering with the Siljanders. 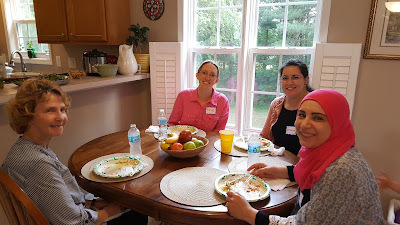 Muslim-Christian Dinner Club: You Can Do It, Too!!! In our metro area, we wanted to create a partnership between a mosque and a church around one simple idea—finding a way to get people together who have reason to remain isolated from one another. Thus, we formed the Apex Mosque-Fellowship of Christ Dinner Club. our gathering numbered about 30. We always start with a potluck meal. 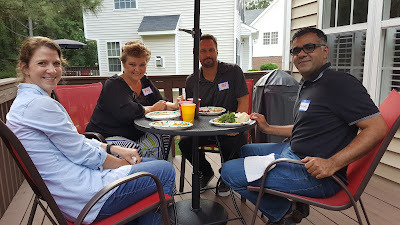 Muslim and Christian friends find spots around our home to eat and chat. his passionate, moving appeals to love one another. Here I'm getting in my two cents as little Omar wonders where my hair went! What Is the Apex Mosque-Fellowship of Christ Dinner Club? 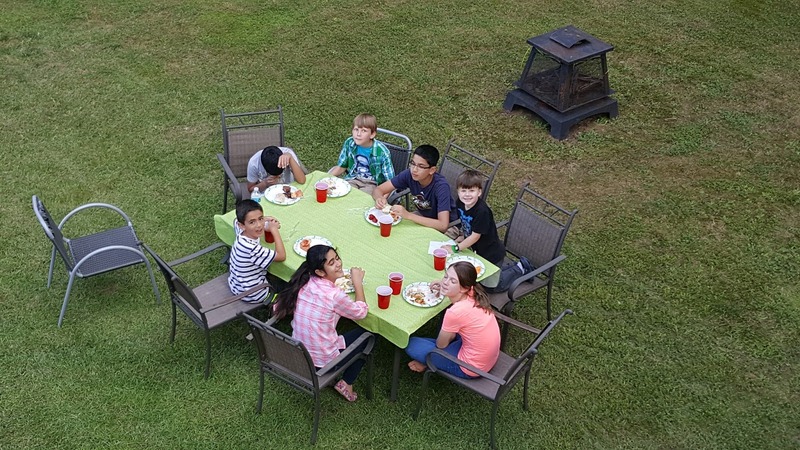 The Dinner Club started 18 months ago with eight families--four each from the mosque and the church--meeting monthly for a potluck meal. 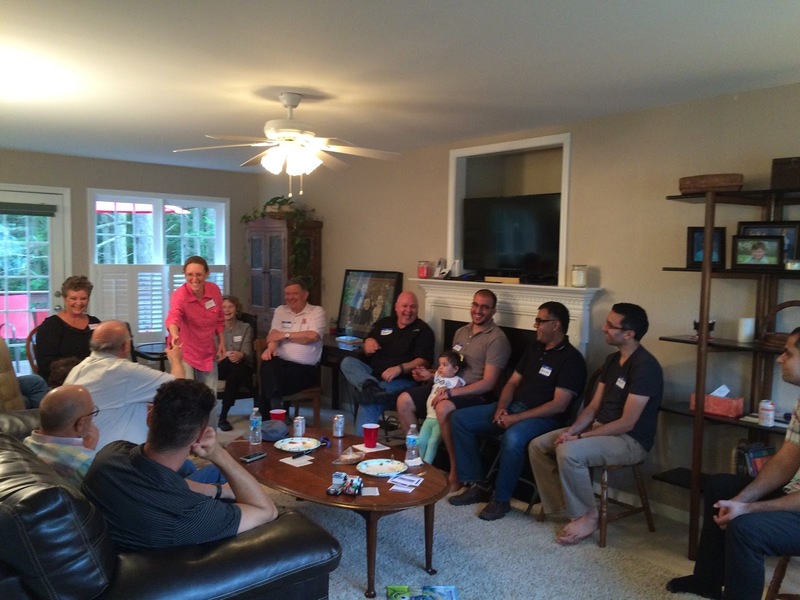 While our monthly gatherings have since grown in size, we have kept the same basic format. Our Dinner Club meets in a home one Saturday per month from 5pm-8pm. Typically, we alternate between Muslim homes and Christian homes. We always have two main components--lots of delicious, diverse food (potluck style) and an evening full of wonderful conversation and fellowship. Our ONLY agenda is building friendship, because we have discovered that real friendship between real people with real differences leads to all sorts of beautiful places! Since we have stayed at this for awhile now with most of the original families still involved, our friendships have grown quite deep. All of us acknowledge how much our lives have been enriched (and at times our perspectives challenged) by these multi-faith gatherings, and we want to spread the love to others. To that end, we are attempting to host a larger gathering several times per year. For these bigger events, we extend an open invitation to Muslims and Christians in our community. Because these open events are too big for a home, we host them in the mosque and church facilities, alternating between the two. It's always good for our group to spend time together in our respective houses of worship, as doing so helps us grow in our understanding of one another. In addition, we have three goals in mind for the Muslims and Christians who are participating in our gatherings for the first time. 1. 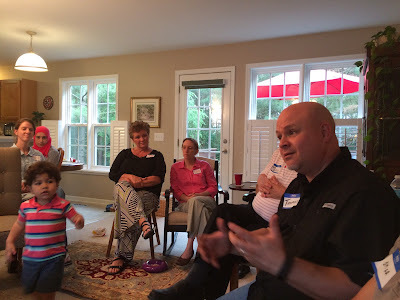 We simply want to give folks an opportunity to connect relationally over a meal with someone from the other faith perspective. 2. We encourage new Muslim and Christian participants to exchange contact info with one another and to meet for coffee or a meal. 3. We challenge them to consider starting their own Muslim-Christian Dinner Club gatherings. It only takes two families/individuals to get started! If you'd like to begin a Muslim-Christian Dinner Club in your area but are not sure where to begin, feel free to message me below. Our group would be happy to share our ideas, experiences, and coaching! Christians to serve refugees moving into our area. It is my privilege to serve as a Global Peacemaking Coach with Peace Catalyst International, a vibrant, growing movement of ragtag Jesus followers committed to promoting peace in the way of Jesus and reaching out in love to those whose backgrounds and perspectives are different than our own. Our work is not rocket science. Rather, it’s simply a matter of opening our hearts (and often our homes) to meet people where they are, to build genuine friendship, and to share with these friends the little things in life—like pancake suppers, play dates with our children, golf outings, coffee shop pow wows, and three-hour potluck meals. This is loving others in the way of Jesus. And it’s how I want to live my life—because it is the way of Jesus, because it’s a liberating way to live, and because real friendship always leads to deep discussions and often new understandings about life and love and the most important matters of the heart. kids will lead the way for us if we let them!!! Notoriously, Jesus was friendly with all the “wrong” people—oppressors, partiers, prostitutes, women in general, and even those from the other monotheistic religion. He gave dignity and respect to all manner of outcasts and outsiders, and He invites us to do the same—to build real friendship with real people with whom we have real differences. Of course, Jesus modeled this in an ultimate way by dying for us while we were still sinners and enemies of God so that we might become friends of God (Romans 5:8), and He invites us to follow His example by living sacrificially for others (1 Peter 2:21). doing so answers questions and dispels fears and myths from both sides. Real friends enjoy one another’s company. Real friends play together and help one another. Real friends make scheduling and financial sacrifices so they can spend time together. Real friends talk openly and respectfully about deep matters of the heart. They share their convictions about faith and family and politics, eager to learn and persuade all at once. And real friends do all this with an abiding confidence that their friendship is bigger than their differences and that love (a commitment to pursue good for someone) covers a multitude of sins and disagreements. Christians, will you join us in following Jesus into real friendships with Muslims? Muslims, will you follow the example of Jesus by building real friendships with Christians? If you would like some tips to help you get started, feel free to post a comment below so that we can dialogue. I will be happy to share ideas, but keep in mind that it’s not rocket science and it might be as simple as smiling and saying hello to someone next time you’re out shopping!